Dr. Duggal is a consummate professional. He explains things very well and listens to his patient. I'm very glad to be a patient of his. My doctor ordered two test one for blood another for x-ray. The receptionist lost my x-ray order in computer an said she would mail it. A week and half has gone by still have not received it. Not good! As always, very caring, courteous & professional. Dr. Duggal has been my heart doctor for many years. He has great staffs working with him. Dr. Dugan talked to me in easy to understand terminology, and had all my medical records in regards to my heart implant monitor which he oversees. He listened to my concerns and answered all my questions. In terms of having patience, explaining things clearly, and being a good listener, Dr. Duggal is excellent. He presents alternatives as options that I need to consider making me an important part of the process. Dr. Duggal is a very good doctor. Dr Duggal is the best. Always explains my questions I might have. Overall my experience was very good. The clinic is on time with the scheduling, courteous, and prepared for me when I have my check ups. Dr. Duggal is the best! It was for an evaluation for a surgery on 5-11-2018 & Dr. Duggal explained everthing that will happen. I am so glad we have this doctor for this procedure. I have a long history with Dr Duggal dating back to 1999.He has done 3 cardiac ablations on me, put in a defibrilator, & removed a defibrilator that was on recall d/t a possibly bad wire. he currently sees me because I have a new pacer/defib in & d/t my history of cardiac arrhythmias. He is an excellent cardiologist, friendly, respectful, easy to talk to & I completely trust his medical opinion. The co-pay for one of my prescriptions skyrocketed from $115 for 3 mos. to $600 for 3 mos. Dr. Duggal was able to prescribe a perfect alternative that I now only have a $10 monthly co-pay. I very much appreciate the kindness and caring of Dr. Duggal and his nurse. Dr Duggal and staff are great. Dr. Manoj Duggal is one of the most intelligent people in existence. He will listen to details associated with any system or issue that may have occurred in the past or present. He is additionally a proactive person who will order tests to not only manage systems of any potential problem, but also calm and ensure the patient that he/she is in good handsBased on my pre-existing condition, I have had my share of physicians. I can honestly state Dr. Duggal is by far one of the best in the medical field. I have confidence in him and feel comfortable talking with him. I am very pleased to have Dr. Duggal as my heart dr.
Have been seeing Dr. Duggal for many years. He has always treated me with respect, and always has taking great care of my family and myself. Doctor and nurse very very good. Dr. Duggal explains everything so I can understand. He makes sure I asked all questions I had. If I forget to ask an important question during my office visit. I can call Dr. Duggal and his nurse(s) are very nice. The receptionists and people who answer phones/make appt. 's are often rude - they chew gum and talk fast - very frustrating. Dr. Duggal is an great Heart Specialist. I have been with him for about 10 years. Doctor Duggal is an excellent health care provider. He is patient and listens and responds to my health questions. I would recommend him to anyone needing health care. I trust Dr. Duggal MD with my life - If I did not there would be no need for this questionnaire. Dr. Duggal is an excellent doctor, he and his staff are exemplary. Dr. Duggal explains things very clearly. When he asks a question he listens very carefully to the answer. He values my opinion in questions regarding my health and choices to be made. I have the utmost confidence in his knowledge and ability, I would seek him out where ever he might go. Good. Did communicate info about last blood test in a helpful way. Realized have need to be more circumspect about what I put in my mouth. I'm always confident that Dr. Duggal is taking the best possible care of my heart condition. This was my first visit with him and I was very impressed with him! I intend to remain a patient of his. I would recommend him to anyone I know who was in need of a cardiologist! They are very attentive and human people all the staff in general. I have a long medical history with Dr Duggal. He has done several procedures on me over the last 18 years. He is always polite & friendly. He is an excellent Cardiologist. I was very happy with this visit. I have complete trust in Dr Duggal. We liked Dr. Duggal very much! Time spent with him was very informative about the procedure I will be having. Dr. Duggal is a wonderful doctor. This visit was very good. Dr. Duggal is a very care of me. dr duggal is fantastic. my only complaint is that he ordered a chemical stress test in his office. he and the scheduler knew my ht and wt...yet when i showed up for day 1 of the 2 day procedure...the medical tech guy who was to perform the procedure said i was way too large for the imaging machine in their office. i had fasted and omitted some meds as directed....but no go...too big. you would think the doc and scheduler would have known that. not the end of the world..but i blew a day. He explained to me my condition and what the out - came could be. I'm very happy with the care I receive from Dr. Duggal. Very thorough & knowledgeable - Very well qualified. Dr. Duggal is wonderful, very calming and never rushes. Even though the dr. didn't speak my language, but I felt very comfortable with him. When I saw him while in the hospital, I was not impressed. I felt brushed off. HOLY COW! Did this visit change my mind. He seemed truly invested in getting to the bottom of what was going on. Dr. Duggal was very informative I was supposed to see a different Dr. but when I got to the office I was told I would be seeing Dr. Duggal. Everything went WELL nothing out of the ordinary. Dr. Duggal was fantastic as always. He and I agreed to have an additional scan done for me to follow-up on the ablation I had a year ago to investigate further issues I've had, something which I feel many doctors would not have done. Dr. Duggal is treating me for A-Fib which he diagnosed about a year or so ago. He has prescribed a blood thinner which I am currently taking and my symptoms are now minimal. I am scheduled to see him about every six months for follow-up visits. Dr. Duggal is an excellent physician and medical provider. Not only explains different therapeutic possibilities, but the benefits & risks of each, plus the overall logic. Performed implant. The doctor did not visit post procedure or later while in patient in hospital. Did not follow up during recovery. Dr. Duggal is very kind, patient and understanding. He always listens to my concerns and he really hears me. I never feel rushed during my visits. He thoroughly explains all possible procedures. He explains all options and leaves the decision to me. Dr. Duggal is a true credit to his profession! I now travel from Manhattan Illinois to the Oak Lawn office to see him. I trust that he has my best interest at heart. Dr. Duggal and his staff are always professional. Dr. Duggal is very nice and friendly. The takes a sincere interest in my problem. He is very knowledge in his field. His nurse was great. Dr. seemed too busy to do the "small" stuff. Not personable at all. Dr. Duggal took very good care of me in the hospital and at his office visits! Very knowledgeable explains things. seems to be "on my side" medically - what's best for me. 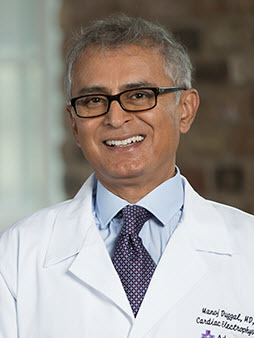 health eNews with Manoj Duggal, M.D.